Crush the biscuits in a food processor and pour the melted butter over. Mix well and spoon into the bottom of 14-16 cupcake cases set in a cupcake tin. Using an electric mixer beat the cream cheese, mascarpone, lemon curd and sugar. Beat until smooth and then pour over the biscuit base. Bake for 5 minutes and then lower temperature to 150c and bake for another 15-20 minutes. Turn off the oven but let them sit in the oven to cool for a bit. It will still be slightly wobbly but it will firm up in the fridge. When cool, place the tin in the refrigerator. 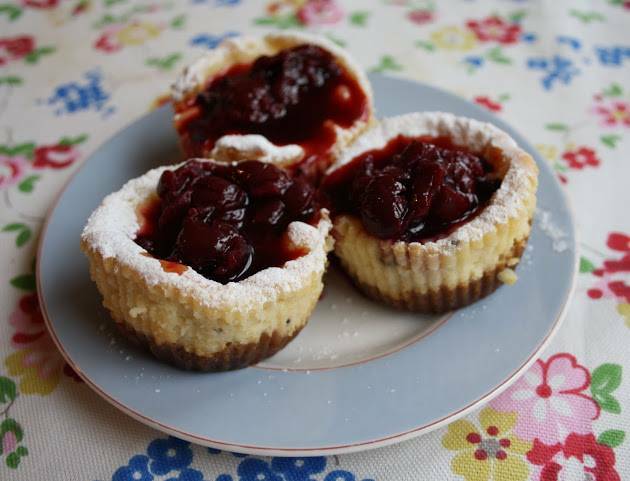 When ready to serve peel off the cupcake wrappers and dollop each cheesecake with some cherries. About this post – Recipe and photo credit by English Provender Co.
"18/03 Creative Mondays Blog Hop And Features…"
"New Ways To Follow Blog Lovin Blog Hop …"
These look so yummy Claire. They would certainly lift my spirit this morning. Have a good Tuesday.